In Tuesday’s post, I hinted at today’s subject for this blog: using the evaluation profile after a game analysis in the Fritz “family” of chess playing programs (Fritz, Rybka, Junior, Hiarcs, & Shredder). Back in the day, the only way to generate an evaluation profile was by playing a game against a chess engine. But somewhere along the way (I’m not sure of the exact version), a feature was added which allows you to create a modified evaluation profile by running a “blundercheck” game analysis. This later form of evaluation profile is what we’re going to look at today. You’ll recall in the last blog post we learned how to start and use the “blundercheck” game analysis mode. In the setup dialogue you’ll find an entry called “Store evaluation”. Checking this box causes the software to add a numerical positional evaluation to every move, as well as a record of the engine’s search depth. This information is visible after each move in the game score, but it can also be used to create an evaluation profile, a colored graph which lets you examine the game’s progress at a glance. You may be familiar with the evaluation profile which can be generated when you play a game against a chess engine. But the profile generated during blundercheck analysis, while similar in basic appearance, functions a little bit differently (as we’ll see). You’ll notice a bunch of colored bars above and below the center line (yes, there are some very short red bars below the line in the above illustration – you’ll see them with a closer look). In a post-analysis profile (as opposed to a post-game one), bars above the line are always green or yellow, while those below the line are always red or yellow. Bars above the line are also indicative of an advantage to the White player, while those below the line indicate an advantage for Black. So we can conclude (obviously) that green bars show a White advantage while red ones show a Black advantage. The height of the bar above or below the line indicates the numerical evaluation of the position. There is a scale in the upper right corner of the profile which tells you what a bar going the whole way to the top (or bottom) of the graph signifies. In the illustration above, the value is listed as “800 cp”, which means “800 centipawns”. Since a “centipawn” is 1/100th of a pawn, a value of “800 cp” is the equivalent of eight pawns (not quite the full value of a Queen). In the above illustration, a green bar which goes the whole way to the top of the graph indicates that White was ahead by eight pawns. That brings us to a yellow bar, which means that the advantage at that point was greater than the graph can show. In the evaluation profile picture above, White enjoys an advantage greater than eight pawns indicated by the yellow bars starting at move 43 and continuing for most of the rest of the game (except for two moves in which his advantage dropped below eight pawns, shown by the two green bars). …which is interesting because White is materially just a pawn ahead at move 35 – so the remaining advantage must be purely positional. The evaluation profile is designed for exactly these kinds of explorations: we’re already seeing aspects of the game which we might have missed had we been looking solely at the Notation pane. Notice, too, a couple of lines appearing below the center line of the graph. These are a visual representation of the engine’s search depths for each move of the game. The blue line displays the search depths for White moves, while the black line shows depths for moves by the Black player. The value for a line which reaches the whole way to the bottom of the evaluation profile is displayed in the profiles lower left-hand corner. In this case it’s “99 ply”. This is highly unusual (you’ll typically see a value just slightly higher than the engine’s maximum search depth reached while analyzing that game). How did this happen? It’s actually an alert generated by the software which occurred at White’s 68th move (as indicated by the blue line’s “peak” at that point). The move at that point was a pawn promotion resulting in a position covered by a six-piece endgame which I don’t have loaded onto my hard drive (I have only the three and four pieces endings as well as a partial set of the five piece tablebases, primarily because I need the hard drive space for many other things besides chess). Because the engine went looking for a tablebase file which wasn’t there, it generated a “spike” at that point. The maximum search depth value in this display is 22 plies (and 21 plies was the deepest search actually reached by the engine during that game’s analysis). This display also shows a game in which the Black player took an early lead and never relinquished it (indicated by the red [instead of green] and yellow bars displayed below the center line). …with the maximum evaluation and search depth values changing accordingly if appropriate. This is also an excellent time to point out that small black vertical line at the top center of the evaluation profile. 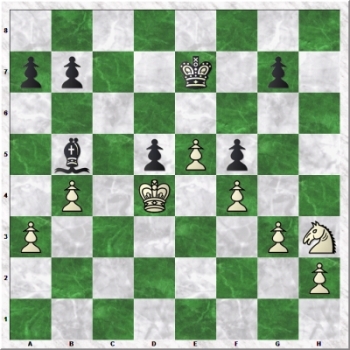 This indicates the move number presently highlighted in the Notation pane (with the move numbers being show at the bottom of the display); in the above illustration, the evaluation profile is centered on move 19, with that move highlighted in the notation and that position being displayed on the chessboard. And should you decide you wish to later hide the evaluation profile, all you have to do is go back to the “View” menu and uncheck its box; the profile’s pane will disappear in the main chessboard screen.